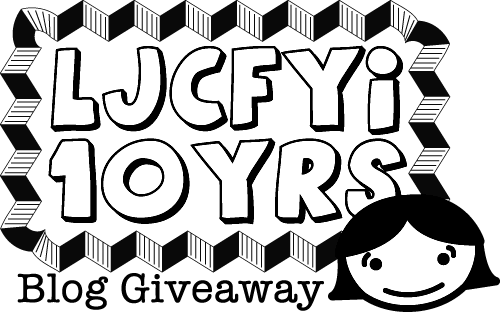 To celebrate my blog's 10 year anniversary I am doing five blog giveaways this month. Each giveaway is based on something that i love. For a chance to win this fabulous prize package all you have to do is leave a comment stating what you do to try to be more green. I will randomly choose a winner on the last day of the month, September 30. I walk instead of driving to work. I no longer take 'baggies' to work with my lunch. I've bought Tupperware-brand items that I put my snacks and sandwiches in! I take silverware from home instead of using plastic silverware at work! Hi ljc! Hope my idea doesn't sound too weird! I live in California where we're always trying to watch our water consumption. While I'm waiting for the shower to warm-up in the morning, I put a bucket under the faucet to collect the cold water and use it to water my house plants and garden. Congratulations on 10 years! I use reusable totes when I go grocery shopping, and recycle any plastic bags that end up in my house. And recycle whatever we can. I take reusable bags to the grocery store! I take my reusable bags with me shopping everywhere! We recycle way more than we throw out. I've carried a water bottle for a million years. I recycle everything I can! I also bring my own bags to the market. I love that bucket to collect water in the shower idea, Julie! I will start doing that. Being green isn't easy. I reuse plastic bags, bring reusable bags wherever I shop, recycle wherever possible and use every square inch of paper to write on. Happy Anniversary! I bring my own bags to the store and try to ride my bike around town. I hang my clothes out to dry. I started to be more green, but I also find it so relaxing. I use reusable bags for everything! We got a compost bin last year, we take reusable bags to the grocery, and we walk instead of drive as often as possible...despite living in the 'burbs! I recycle and I'm teaching my daughter who is 15 months to recycle too! I also use natural hand made soaps and shampoo bars. Let's see, we've got the aluminum water bottles, reusable bags, and we've been hanging some of our clothes to dry. We also want to try making out own laundry soap, but not only for the green purpose, but because of our allergies as well. We already bring our own bags to the grocery, but right now, I'm working on weaning us away from using paper towels and instead using the waffle weave dishcloths. Recycle, reuse! cut way back on magazine subscciptions. Stopped buying bottled water--use a SIGG Bottle. And reusable grocery bags. I am trying to use some more "green" cleaners. I am using vinegar and water to mop the floor. The smell doesn't stay around long and everything is still getting clean! Greener and cheaper too! I collect reusable bags! We have a compost pile, I try to bike to pick up my son at school. Our family car is a Prius. To be more green, I have been purchasing foods at local markets, organic when possible (and using reusable bags). I've also stepped up my recycling a lot over the past year and now have a trashcan that is half the size of my recycle bin. And I am happy to say, the recycle bin gets full much faster still! I've also been trying to use products that are less harsh to the environment. And most of all, I have been trying to to bike whenever I can to places to save fuel! Every little thing you do adds up. There's so much people can do without even realizing it that can make a big difference! We recycle as much as possible and use our food scraps to compost! I print double sided when I need a hard copy. Reusable bags, recycling/craigslisting as much as possible, green-friendly cleaners, light bulbs et al...always looking for more ideas! I need to use reusable bags more often. I tend to forget and leave them at home. I should make more of a routine of putting them back into my car right after grocery shopping. I try to recycle and/or repurpose as much as I can. I'm also trying to do small things like buy a reusable coffee filter instead of using and throwing away paper filters daily. I use Feline Pine (the clumping kind) instead of clay cat litter. Then I reuse those long skinny plastic newspaper bags to scoop the litter in. The use of the long bag allows so I don't have to tie the bag in a knot, and offers the contents to have a fighting chance at getting out at the landfill and naturally degrading. At least I imagine. Too bad cat poo is too toxic to compost. Happy 10th! I use Method cleansers for our floors. Baby steps. I am trying to buy and bulk or from the farmers market. This way I am using my reusable bags, and no packaging! It is crazy how much packaging some items can have. I jot down confirmation codes on scrap paper instead of printing them out from the computer...saves ink and paper! I've also turned milk gallons into hanging plant holders! Congratulations on ten years! Your blog is one of my favorites. Aside from recycling, we use cloth diapers for our baby. collect stuff to bring to East Bay Depot for Creative Reuse, a cool art store here in Northern California! It's also a fun place to shop! Part of the reson I'm a vegetarian now is to lessen the impact of the meat processing industry on the environment. I also recycle anything I can. I recycle... and carry a reusable bag EVERYWHERE!! I use cloth wipes at the kitchen table for the baby instead of paper towels. reuseable shopping bags and we recycle everything we can. I also try to shop as local and organic as possible. I am trying to use more "green" cleaners to mop the floor, clean the toilet, etc ... I also reuse sandwich baggies when I take bfast/lunch to work or when I pack my 15 month old son's snacks. I use re-usable shopping bags and when I don't use those I recycle the plastic ones. Either in the bins at the store or in crafting projects. Now that my 5 year old is in school and learning about recycling, we recycle just about everything. It's been fun watching him learn how to help the earth by using cloth bags rather than plastic, recycle everything that we can, and be aware of our electrical use. I buy our office supplies at work and I only buy pens that are made with recycled material, are refillable, or have biodegradable components. Reduce, reuse, recycle just about sums it up! Our cans go to my brother-in-law which he cashes in for my nieces college funds. We contribute by drinking beer! We use Envirosax and Method products, I recycle almost everything, and no longer use plastic water bottles. we make our own soda at home instead of buying canned soda and sparkling water- saving the empties from having to be recycled and the impact on the environment from the gathering and shipping of bottles of soda and water. I recycle, try to use reusable bags when I remember and make the effort to turn off lights and appliances. I use recyclable bags when shopping, grow our own vegetables that we know are safe to eat, never throw aluminum cans in the trash, we donate them to our local fire dept. who recycles them and any money they receive for them they use to teach the kids in school about fire safety. We also recycle our plastic containers and newspapers so they don't go into the landfill. We try to do our part to make it a better world. My husband made rainwater barrels for our garden, I made cloth grocery shopping bags, we have a compost pile, our electronics are on power cords that shut down when not in use...we're working on it! We use clothe sacks or Envirosax like products for our lunch bags and groceries. of course reusable shopping bags, and also green cleaners. At work, I take recycled paper from the copier and fax to make scratch notepads for myself for the week. I also buy local produce and meat. Oh! And just started getting used to turning off faucet when brushing teeth and loading dishwasher. Happy Anniversary Jenny! I've really enjoyed your blof for years now! I save egg shells and use them to make better soil in the backyard. We live in the country so we are able to grow a fairly large garden. I can all of the veggies. I LOVE my canner. The fresh food tastes great! I've imposed a strict, $5 fine for every non-reusable bag that makes its way into my house! I exclusively use reusables so I'm not the culprit! We went down to just 1 car. My husband bikes to work now and I primarily only use the car go to to the grocery store or Target. Most of where I need to go I can walk. Saves us money, is better for our health and is green. Win, win, win! We are a one car household, I use reusable bags, and I'm trying to cut down on my use of baggies. My husband and I buy (or make!) eco-friendly items (i.e. 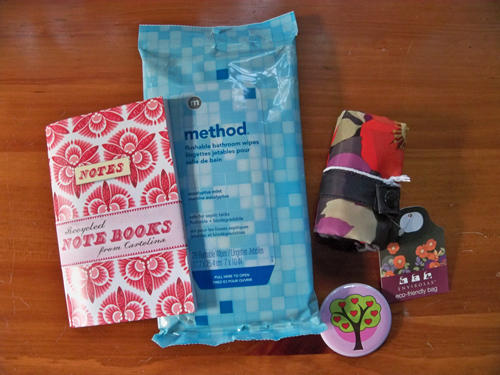 reusable shopping bags, cloth napkins) to give as gifts to our friends and family for any occasion, have installed a low-flow flush adapter on our toilet, actively compost and garden, and are environmentally conscious when it comes to our shopping, driving, accommodation choices in every day life. Yay Earth! I try to get my stubborn boyfriend to recycle like I do! And I always use the compost bin whenever I can. Like everyone else, I recycle and instead of using wrapping paper at Christmas, I made a bunch of fabric bags that we use each year. Any excuse to be crafty! I work in a casino, and all year I smuggle empty cigar boxes out to use as gift boxes come the holidays. Some of them are crafted better than jewelry boxes! And the little wooden blocks in them make bonfires smell AMAZING. We recycle everything that we can, and use lots of reusable shopping bags. Two years ago my New Year's Resolution was no more plastic carrying bags--so far, so good. We hardly have any! i recycle everything i can and try to bring reusable bags, if i can remember! We recycle, use reusable bags and shop at thrift stores. Bring lunch in a NOM NOM bag (from thinkgeek.com). Use a titanium spork (also from thinkgeek). Water plants with water from my aquarium water changes. Re-purpose containers for storage, repotting, and small project organization. I'm trying to hard to be more green. I don't have a backyard composter and my husband isn't ready to have one, so we collect all our veggie scraps for our neighbor's compost. I save all my used coffee grounds for my flower beds. We sold one of our two cars and now get by with just one. We got a bike trailer for my little boy to ride in and now try to ride our bikes whenever we go out to dinner. I've tried to remember to turn the faucet off while brushing my teeth, and I'm diligent about turning off lights when I'm not in the room. We've still got a ways to go, but we try! Remember to bring in the reusable grocery bags and carpool! I've been a long time creeper of your blog for years! I love all your green ideas and I've bought a lot of items based on your recommendations. :) Love your blog! We walk or take the subway as much as possible. Never get plastic bags at the grocery store (I have canvas one's stashed EVERYWHERE), Lunch skins not baggies, we compost and grow our own veggies and herbs (and this is in NYC), and we try to use water sparingly. I use reusable bags at the grocery store and Lunchskins reusable sandwich & snack bags for the kids to take to school. Congratulations on 10 years! I love your blog and have been a loyal (but silent) reader for the past 9. To be green I ride my bike to work when I can, use reusable bags and water bottles, and belong to a local CSA! I limit using disposable items like plastic bags and baggies, paper towels, plastic utensils, paper plates, etc. I ride my bike to the grocery store on occasion. I teach my son to use less and recycle when he does need to use something. I work in a lab and was able to start a recycling program for all the labs...I felt pretty good about it! I compost, recycle and drive a hybrid. Reusable grocery bags for everything instead of plastic. And I traded up to a bento box instead of my usual lunch packings. I use reusable grocery bags and recycle and use natural products when possible. I have stuck to my New Year's resolution to use my EcoSax for groceries every time I go. I used to forget them but I've done well being green in 2010. We use cloth napkins for every meal. I have my own set of silverware at work. And the most green thing I do? I go to work everyday where I write laws to keep the air clean in California! Bring reusable bag when doing grocery shopping and bring own container when buying takeaway food! Throw recyclable items in recycle bin! BMOC...bring my own cup when able. I recycle everything! Also, I use a water bottle instead of buying plastic bottles, and I belong to an ecology club that picks up litter once a month! I bring lunch in reusable containers, and use silverware and a mug at work instead of plastic utensils and paper cups. Recycle, take my own bags to the store, compost, take my water bottle to work, take my lunch, try to use ecofriendly housecleaners most of the time, hang clothes out to dry. I recycle, compost, use reusable bags and make my own household cleaners from natural products. I try not to buy bottled water. I bring a nalgene full of brita-filtered water with me to work each morning. carpool or ride our bikes to work. plug things into power strips and turn them off. Reduce, reuse, recycle! I use reusable water bottles and shopping bags. Greencycling (Seattle makes is easy by composting our yard & food waste). I tend to buy used clothing and furniture. I recycle everything (if you live near IKEA, they'll take batteries and lightbulbs), carry reusable bags and water bottles, walk whenever I can, and avoid buying plastic as much as possible. When I am finished with printed material at work I cut the pages up into four to use as scratch paper. I'm also pretty consistent about bringing my own bag, and I wear my clothing until it dies. We use cloth napkins and rags instead of paper at home. I've stopped using paper towels and napkins! Still having trouble giving up the baby wipes. I use my envirosax religiously! Wow, really great ideas so far! Along with recycling. I reuse everything made from glass that comes into this house. My husband thinks it's weird that I have a ton of jars lying around but they all eventually get used to store something or other. I also reuse envelopes and printed papers to make sewing patterns and templates. I always print on both sides of every page before I recycle. I collect all the water bottles from work and take them home to recycle.